Gone are the days when traditional farming and irrigational methods were enough for agricultural workers. Several mechanical inventions have made farming practices easy. Unfortunately these developments are for rich farmers. Majority of rural cultivators don’t have enough money to opt for irrigation facilities as it involves the use of power. They often find it difficult to pay for hefty electricity bills. 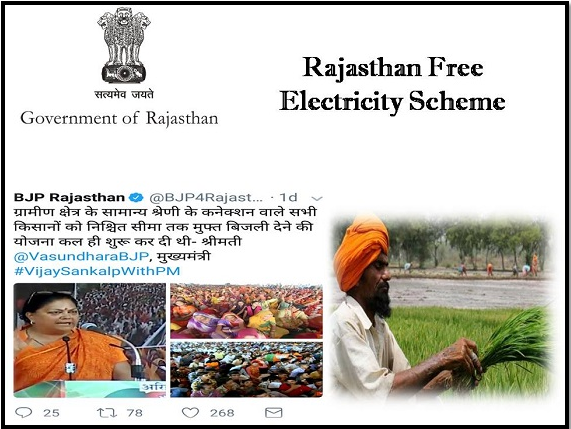 The Rajasthan government has come forward with a new Free Electricity Scheme for these rural farmers. Under this scheme, state government will pay back a certain amount, once the farmer pays the electricity bill. Monthly financial assistance – The state government will deposit Rs. 833 in the bank account of all selected farmers on a monthly basis. This money will be deposited only after the farmer deposits the electricity bill for that month. Total beneficiaries – The scheme is expected to offer the benefits to as many as 12 lakh agricultural workers in the state. Development of farmers – This scheme has been designed for the betterment of rural farmers. Agricultural workers in the villages cannot use irrigation machines due to the power shortage. This scheme will put an end to this ordeal. Increase in income – With free power supply for longer hours, rural farmers will be able to get irrigational facilities easily. This will impact their agricultural production. The state has the motto to increase each farmer’s earnings by double by the end of 2022. DBT facility – All the selected beneficiaries will be able to attain the financial grant, offered by the Rajasthan Government through DBT or Direct Benefit Transfer. Residential status – As the scheme will be run by Rajasthan government, it is obvious that only legal residents of this state will be allowed to take part in this scheme. Residential papers are a must for enrollment. Professional criterion – The scheme will offer financial benefits to farmers only. Thus, necessary registration documents must be shared during enrollment. Type of farmers –These farmers must reside in rural and remote areas. Though nothing has been mentioned, it is safe to assume that small and marginal farmers will get this benefit. BPL card – All farmers must have their names in the SECC 2011 data list. This means, they must fall under the poverty line. BPL certificates must be furnished to support their claims. Aadhar card – It will be necessary for all applicants to have their Aadhar cards. Without this document, they will not be able to register for this scheme. Electricity connection – Farmers who already have general power connections, can apply for this scheme. They have to submit photocopies of power consumption bills durng registration. The state government has only launched this scheme. It is yet to be implemented officially. Tall scheme nitty-gritties of the policy are yet to be announced. As of now, nothing much is known about the Free Electricity Scheme. As it will offer benefits to the farmers, residing in rural areas, authorities may opt for offline registration. Offline registration in village camps or Panchayat offices may be an easier alternative for such people. As the state comes out with these details, you will get it first on this website. Apart from this fee electricity scheme that has been introduced exclusively for agricultural workers who operate in rural and backward areas, the state CM is also keen on solving drinking water issues as well. She announced that activities under the Eastern Rajasthan Canal Project are in full swing. When completed, this project will quench the thirst and irrigation requirements of people, living in 13 districts.